Success is great right? It’s what we strive for. It’s what we congratulate each other on. Getting that promotion; closing that deal; exceeding our client's expectations, acing those exams. We celebrate success. But what if success isn’t all it’s cracked up to be? What if it's missing something important? I'd like to take a look at the alternative. Let's talk about failure. That’s a word full of implications, right? 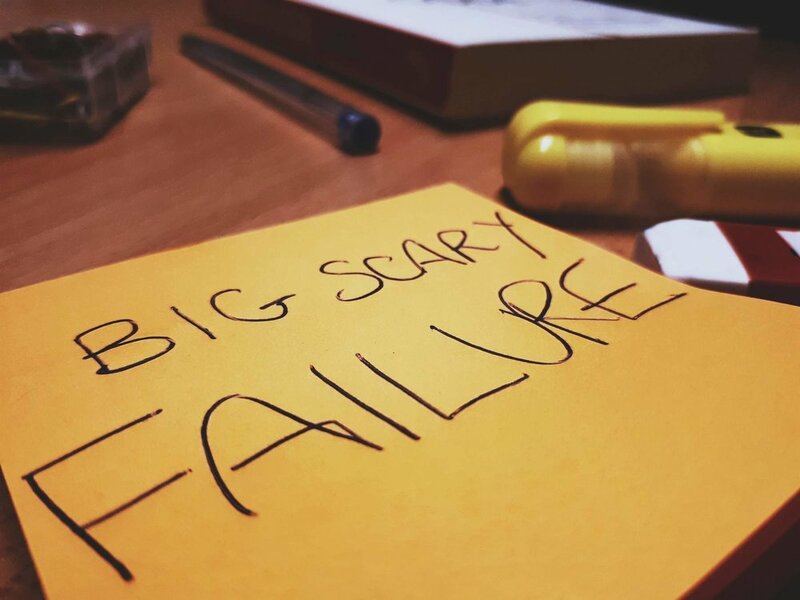 Big, scary FAILURE: losing a client; losing a deal; losing a job. Think about a time you messed up. How does it make you feel? We naturally shy away from failure. We stigmatise it. Failure scares us, so we play it safe; we stick with what works; we don’t take risks. Failure teaches us. At the very least we learn what not to do next time. It’s liberating to allow ourselves to fail so long as we learn from it—the experience helps us progress. Failure is the best teacher. Failure forces us to get better at what matters. Success can come from expertise, skills and effective planning, but it can also come from not setting the bar high enough, or simply from blind luck. On the other hand, failing means we get to practice behaviours such as perseverance; deep work; picking ourselves up; overcoming adversity—what Angela Lee Duckworth calls "grit". These lessons compound. They shape us, allowing us to set the bar higher and accomplish greater things. Failure connects us. Being open about our failures lets us connect at a more human level with those around us. Everyone makes mistakes, and sharing them brings us closer to each other. It breaks our ego—that part of us which is so often the biggest obstacle to personal and professional growth. We see this clearly with the massively popular Fuckup Night movement—more on that below. Failure reveals our inner strengths. We're at our strongest when we're vulnerable. Why? Because when we let our guard down we become more relatable; our actions more meaningful; our intentions more sincere; our priorities and vision clearer. Failure keeps us humble. Humility begets growth. It's impossible to learn without first admitting that we don’t have the full picture. The more we embrace gaps in our knowledge and understanding, the more we allow ourselves to learn. This is Liz Wiseman's Power of Not Knowing. Failure is essential for success. By embracing failure and learning from the mistakes of ourselves and those around us we build a foundation that helps us exceed our ambitions. The less we seek to avoid failure, the more likely we are to pursue opportunities with potential for huge reward. We take risks, and tackle challenges with the confidence, experience and wisdom that we bring from past failures. Perhaps we can never truly succeed without first failing. So where does this leave us? Failure is crucial in forming our attitudes, behaviours, and even our identity. But it makes us uncomfortable, and that scares us. A powerful way to overcome this fear is to change our mindset: to look at failure as an essential (if unpredictable) feature of growth. In this sense, to truly succeed is to focus on the process, not the result. Carol Dweck coined the term Growth Mindset to describe one’s openness to the idea that we can always learn; always improve: only when combined with effort does ability lead to achievement. This mindset shift underpins all our training. "Becoming is better than being"
Fortunately, when it comes to failure we're not alone in facing our fears. We can build a more healthy relationship with failure by sharing, and being open with others about when we fail. By loving the learning process. By admitting our mistakes, and realising how much they teach us. By supporting others in their failures. In short, we must embrace failure. Joe Lodge is Engagement Manager & CEO at DodoWorkPlay. Here in Mauritius, failure is catastrophic, to be avoided at all costs. Together with Red Dot, Turbine and ICT.io, we at DodoWorkPlay want to change that. That's why we're bringing Fuckup Nights to Mauritius. Fuckup Nights run in over 250 cities around the world, providing a forum to embrace, share and learn from failure. There will be food, drink and informal networking. We hope to see you there!